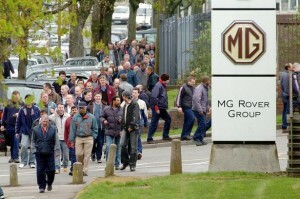 April 2015 will mark ten years since the collapse of MG Rover in Longbridge. I know people around here will never forget it. When the company closed in 2005 six thousand people lost their jobs and were left utterly exposed. But the impact went beyond those workers – the collapse affected whole families, and the community that MGR had been at the heart of for a century. This week I secured a Westminster Hall debate on the collapse of MG Rover which you can read here. I not only wanted to talk about the profound impact it had on our local area, but on the wider region and for the Government’s policy on corporate governance, pensions and employment law too. Because the effects of the collapse went far beyond Longbridge. From Bromsgrove to Burntwood, hundreds of small and medium sized motor and manufacturing businesses that were part of the MG Rover ‘supply chain’ experienced reverberations too. And the closure would have been much more painful for the West Midlands if MGR had collapsed when BMW pulled out of the company at the turn of the Millennium. Those five years bought our regional economy crucial time to modernise, and become less dependent on Rover. Job losses in 2005 were half the level they would have been in 2000. That is why, ten years on, there is still a debt to the MGR workers that has not been paid. They lost their jobs having bought five years to help thousands of others keep theirs. Promised a Trust Fund by the owners of consortium who took over the company from BMW, a decade on they still have not received a penny. The “Phoenix Four” made millions from a collapse which left many workers struggling with unemployment, lower wages and in insecure work. Our area now has one of the worst records on low pay in the country. There is no doubt that South West Birmingham is now looking to the future – from the £1 billion Longbridge redevelopment delivering new jobs and homes, to Bournville College, and exciting manufacturing and tech companies -including MG – building on the area’s heritage too. But the impact of the 2005 collapse on those that worked there and the wider community will never be forgotten. That is why I will not stop calling for justice for the workers. Last year the multinational accountancy firm, Deloitte, was fined millions over conflict of interest issues associated with the advice they gave to the Phoenix Four. After their recent appeal, there are still questions over the precise amount of this fine. But there is no question in my mind about what should happen when the decision is finally made. The 10 year anniversary is surely the time to ensure it goes to those who lost everything in 2005.